The closest thing homeless vet Mark Yanagida has to an address is his mail box inside Century Center on Kalakaua Avenue, a short walk from Ala Moana Park. MARK YANAGIDA, 59, who says he is a Vietnam veteran and retired federal civil service employee, resents being called an "eyesore." Yanagida has a service-connected disability and his wife, Anne, is blind. They have been homeless since November, living at Ala Moana Regional Park. "It's a traumatic experience," he said, explaining that he thought he was "going to die several times" during the recent severe thunderstorms. "The wind was blowing so hard" and the couple was protected only with a drop cloth, he said. Yanagida doesn't know where he and his wife will go tomorrow when the city shuts down Ala Moana Park for repairs and cleanup work. "I have no place to stay. I can't drive to another park. I have no bus pass to go to Kapiolani (Park.) We're being treated like dirt right now because of something we had no control over. "Police say taxpaying citizens are unhappy they can't use the park and high-rise buildings are looking down on us as eyesores. "I take offense to that. We can't help the way we are. We're human beings." City Community Services Director Debbie Kim Morikawa said Friday that the city is in discussions with homeless service providers to help those living in the park. Yanagida said he's "exhausted all available outlets" for housing, including federal, state and private subsidized housing. He could get into veterans' homeless housing but they won't take his wife, he said. "I've tried everything. I see it as a civil rights issue, rich against poor," he said. Yanagida said he worked for the U.S. Postal Service for a couple years after finishing Hawaii Army National Guard service. He then became a civilian worker for the Navy at Pearl Harbor in 1975 and held various jobs for the Navy, Tripler Army Medical Center and Fort Shafter until retiring in May 2004. He and his wife were renting a home, but their landlord gave them 45 days to find another place, so they moved to Las Vegas in May 2004, he said. "It was a little more affordable but I got homesick," he said. So they came back here in August 2005 with financial help from his wife's sister, he said. His wife was against it and "it was a terrible move on my part," he said. "It was so terribly expensive, much more than when I left. Now I'm making much less on retirement." He said they lived at a hotel for awhile with money from his sister-in-law in Mississippi. Then her home was devastated by Hurricane Katrina and she had to discontinue helping them. When they began staying at Ala Moana Beach, they didn't know the rules or regulations, he said. A public defender explained them after they were arrested in December for illegal camping and had to go to court. "Other times we were given warnings, numerous warnings, even though there is nothing over my head (no tent) and we're not doing anything wrong," he said. Some police are compassionate, saying they can stay the night but they must leave in the morning, he said. "A few enjoy doing their jobs, chasing people around in the rain. I served my country in Vietnam; I got decorated. They don't care that I'm a veteran or disabled or old. They talk to us like they're treating criminals." 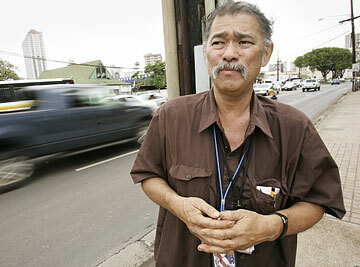 The problem, Yanagida said, is that all homeless people are thrown into one category. Those with drug and mental health problems are tied in with those like him who worked, retired and pay taxes, he said. He gets $1,172 month in retirement benefits monthly and $305 in veterans' disability. He has a right to free medical care at Tripler, but not his wife, he said. And they have no car or bus money to go back and forth, he said. He receives some free bus passes at the Veteran's Center but uses them "frugally" to go to food pantries and appointments at the Veterans Administration, he said. The couple goes to Ala Moana Park about 9 or 10 p.m. each day and leave at about 6 a.m. for Ala Moana Center, where they eat and stay until it closes. They push a cart with their belongings to Century Center, where they have a private mailbox. They went yesterday, hoping to find something in the mail, "a little bit of money," Yanagida said.